“What interests me is a machine that can think and feel,” says Deon Wilson (Dev Patel). Deon’s a brilliant programmer who’s created the first successful AI robots that can be used by the police in South Africa as patrolmen (called Scouts) to help fight crime in the sci-fi action film Chappie. Not everyone is a fan of Wilson’s robot cops, however. Vincent Moore (Hugh Jackman) is a colleague of Wilson’s whose super battle robot project has lost funding due to the success of the Scouts, and he’s out to sabotage Wilson’s work even if it means the city could fall into the hands of criminals. Also out to get Wilson and his Scouts is a down-on-their-luck gang who need a big score to settle a huge debt with a crime lord. The gang, led by Ninja, believes that Wilson has the ability to hit a switch and turn off all the robots, thus allowing the criminals to pull off their big heist without the fear of robot cops shooting them down. Not content with his huge success, Wilson sets out to secretly build and create a special robot, different from all the others – one that has the ability to learn and feel. Before he can finish his sentient robot, Wilson is kidnapped by Ninja’s gang. When they discover the parts Wilson has for his special robot, the gang forces him at gunpoint to make the robot help them with their heist instead. It’s not long before Wilson creates Chappie (Sharlto Copley), a robot that can think, feel and question, but has the intelligence and simplicity of a child. As Ninja and his gang attempt to train the new robot to use weapons to aid in the heist, Wilson struggles to get Chappie to learn simple tasks, to express himself artistically, and to develop a moral code that will not allow him to hurt humans or commit other crimes. Things get even more complicated when Moore, who’s been following and spying on Wilson, learns of Chappie and his capabilities and sets out to destroy not only Wilson’s new pet project but also the other police robots in order to give his own project, Moose, the chance to clean up the streets. Directed by Neill Blomkamp (District 9, Elysium), Chappie is a sci-fi crime thriller that suffers from one-dimensional characters and a soulless script. It’s Robocop meets Short Circuit minus the laughs, originality, and heart. One of the film’s biggest crimes is the waste of extremely talented actors including Hugh Jackman as Vincent Moore, who’s nothing more than a boring, angry, envious bully, and Sigourney Weaver as the CEO of the company responsible for creating the police robots. Another drawback is the casting of Ninja and Yo-Landi, members of the South African rap group Die Antwoord, as alternate versions of themselves in the film. Their characters look and sound as though they belong in the new Mad Max reboot instead of this sci-fi mess. Dev Patel is adequate as Wilson, Chappie’s creator who gets his greatest satisfaction by reminding the robot he’s his maker. The best performance in the film is by Sharlto Copley. Copley reunites with his friend, director Neill Blomkamp (the two previously worked on District 9 and Elysium), and not only did he provide Chappie’s voice, he was also on set acting out the character so that the animators could create Chappie over his performance. Copley refers to the way Chappie was put together as being done via a “poor man’s motion-capture” process, and he gives the robot the right amount of childlike innocence and at times an unintentional sense of humor that makes him likable and more “human” than any other character in the movie. Other than Chappie, the CGI effects are solid but not groundbreaking. 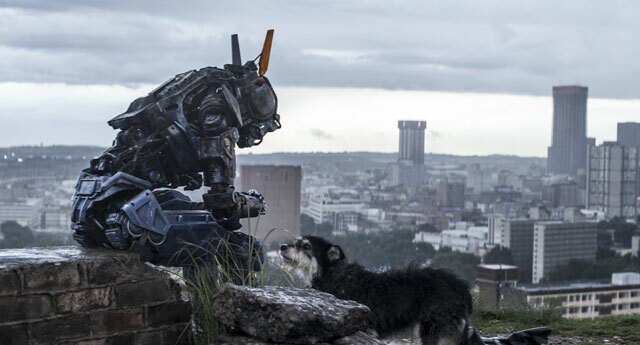 Missing the emotion and heart necessary for movie audiences to connect to the thinking and feeling robot, and saddled with boring characters that feel more like caricatures, Chappie is a sci-fi thriller that fails on all levels.